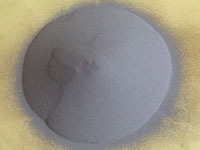 Stanford Advanced Materials (SAM) provides high quality titanium powder used for thermal spraying coatings. Related products: Copper Powder for Thermal Spraying, Molybdenum Powder for Thermal Spraying, Nickel Powder for Thermal Spraying, Silicon Metalloid Powder for Thermal Spraying, etc. The materials of thermal spraying coatings are commonly in forms of powder, wire or rod. They are heated and convert to micrometer-size particles. Then the particles are accelerated towards substrates and create a coating. Titanium readily combines with other metals to form useful alloys. Thermal spraying coatings of titanium powder are light with relatively high strength and resistant to most corrosives.